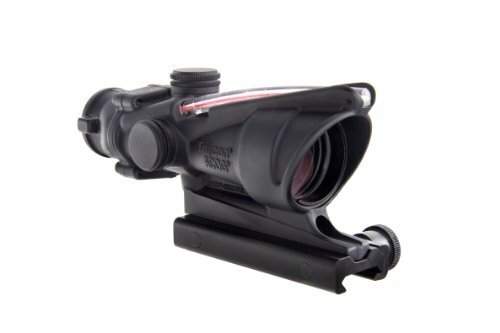 As a Marine I get a lot of questions of ACOG versus this, ACOG versus that, what do I think about AACOG versus scopes? Acog vs (Insert any model here). Since this question shows up so often, let’s look at three of the best-selling moderate range, AR-15 style scopes versus the Trijicon ACOG. There are a few models of the ACOG but we are going to focus on the most popular and highest selling model: the Trijicon ACOG 4×32 with 223 ballistic reticle. Hopefully, by the end of this article, you’ll have a better understanding of the eternal question of who wins in the Battle of the ACOG vs Scopes. The Trijicon ACOG is easily one of my favorite optics of all time. I went across the world with it twice, went to combat with it, and it was a constant companion. 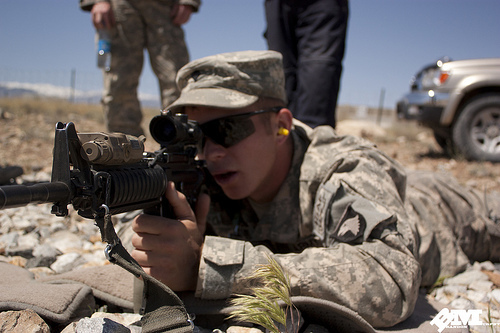 The Trijicon ACOG is a very capable optic that utilizes a fixed power mechanism. The 4 power is the best option for both close quarters and moderate range combat. The ACOG has an illuminated reticle that does not require batteries. 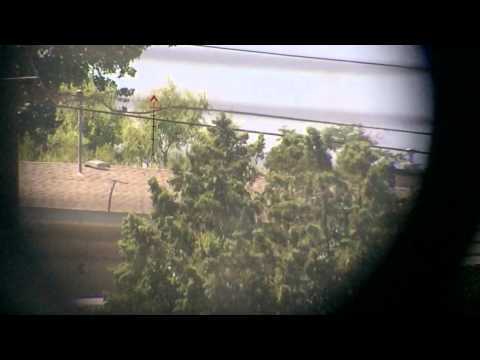 The scope also has a ballistic reticle that allows shooters to reach out to 800 yards. Since it’s paired with the 5.56 or .223 round, it is most effective within 500 yards due to the round’s ballistic limitations. The optic is made to go to war and to be unbreakable to Marines. A rare feat indeed, but I’ve never seen a Marine break an ACOG. They are waterproof to 500 feet and sit in a 7075-T6 housing that is the exact same material used to create AR 15 lower receivers. It’s as close to unbreakable as a scope gets. It’s easily the toughest scope in the tactical realm, slam-packed with features that make it an excellent combat optic (see full specs). It’s a solid contender for hunting, competition, and of course for duty and combat use. It can be hit with an oddly high price tag, but quality comes at a price. The biggest question is do you need the features the ACOG has? Or could you go for a more affordable option? The Nikon P-223 shares a lot of features with the Trijicon ACOG. First off, it’s a fixed-power optic with a relatively low power of 3x magnification, the objective lens is the same size and the optic has a ballistic drop reticle just like the ACOG. The P-223’s BDC reticle provides the user a series of dots that represent bullet drop at 200 yards, 400 yards, and 600 yards. These hash marks are dialed in for a 55 grain NATO cartridge and there will be slight variations with heavier rounds. The Nikon P-223 does come with fingertip adjustable turrets that are designed for easy for easy windage and elevation calls on the fly. The turret adjustments are ½ MOA and can be reset back to zero after field adjustments are no longer needed. The optic is waterproof and sealed with O-rings to prevent leaks and dirt and debris from entering. Clearly, the biggest difference in performance is going to be the ACOG’s overall durability and tough factor. I’ll always say if you plan to go to war for a year or two, take the ACOG. If you are a competition shooter, a hunter, or general plinker, the Nikon P-223 is a great choice. It’s small, light and offers a lot of the same ACOG features. It even offers fingertip adjustable turrets, which the ACOG does not. The price difference is also quite massive, and clearly the P-223 a lot more pocketbook-friendly. The Bushnell AR optic line is one of my favorite AR scopes if you want to stress affordability and quality. 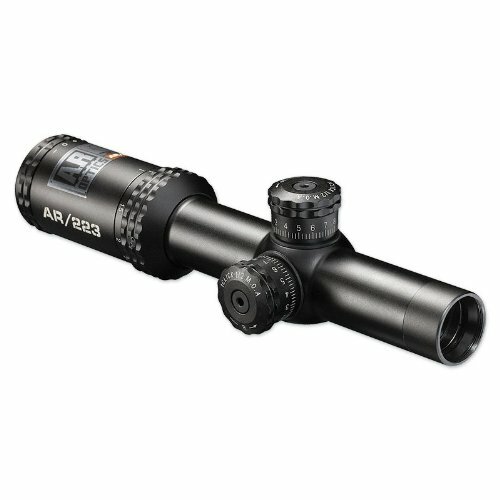 The AR Optics line of scopes has proven to be quite popular and very successful. Bushnell has a long legacy of high quality and affordable scopes. This particular model is the 1 to 4 power optic with the Drop Zone 223 reticle. 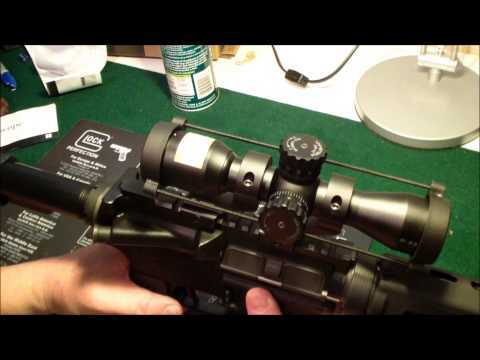 The reticle is a ballistic drop compensator that gives holdout points for every 100 yards out to 500 yards. It’s calibrated for 55 and 62 grain .223 and 5.56 projectiles. 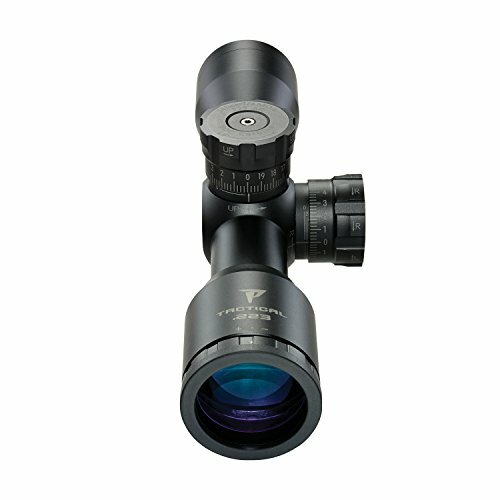 The scope is variable optic that allows the user to go from 1 to 4 power by a simple spin of the magnification dial. The 1x magnification setting allows the optic to be easily used for close quarters. When combined with the fast focus eyepiece and illuminated reticle it can effectively be used as a red dot optic. The turrets are also fingertip-adjustable and can be reset to zero. 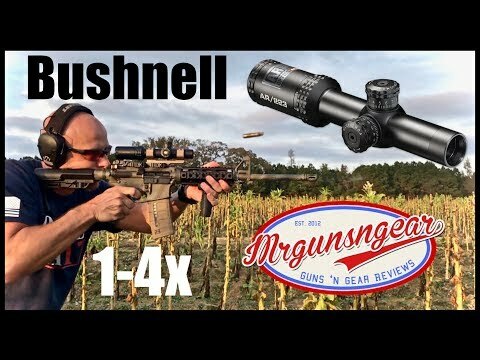 Bushnell AR Optics 1-4x Scope: Great Budget Optic Or Junk? The biggest factor to note is the fact this is a variable scope that offers 1 to 4 power settings. The ACOG is a fixed power scope. Fixed power scopes are usually stronger, but variable scopes are more versatile. The ACOG is the stronger optic, but Bushnell does come back with an excellent warranty that will protect the scope from misfortune. Again, the price is another consideration. 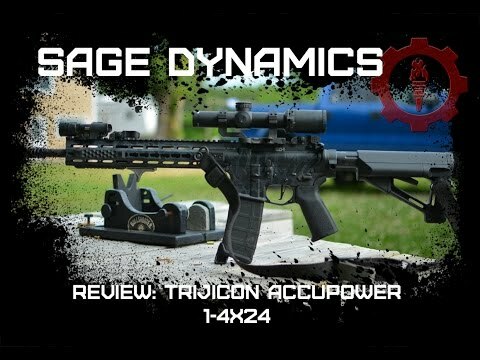 The Trijicon Accupoint is another 1-4 power option with a 24mm objective lens. The Accupoint’s simple triangle reticle is illuminated through Trijicon’s famed fiber optics system for battery-free illumination. There are no batteries required to make the illuminated reticle function. This system is very simple and so effective it can become too bright. If the reticle is too bright you can rotate a cover over the fiber optics and reduce the brightness levels of the reticle to more comfortable levels. The magnification ring features a miniature throw lever to make changing the magnification easier and smoother (see full specs). The variable magnification and reticle make this an optic designed for rapid engagements at close to moderate ranges. This is an optic that is perfectly suited for the AR platform. The Trijicon Accupoint is also extremely well made, and designed to the highest of standards. 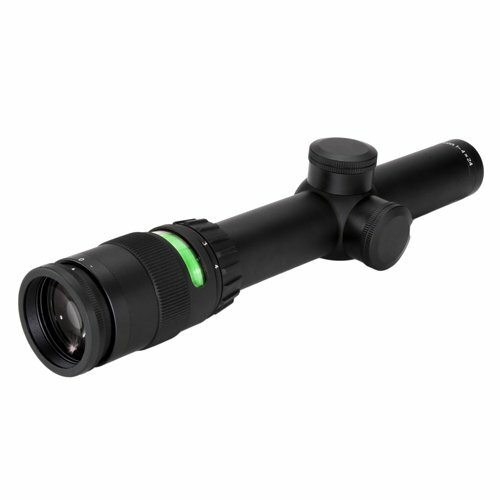 Again, this is a variable optic that allows a wider variety of magnification ranges. This gives shooters a wider variety of options. The ACOG’s ballistic reticle does make longer range shooting simpler than the Accupoint’s simple triangle. The two scopes are both built extremely well and are incredibly tough. The Accupoint is generally cheaper than the ACOG (though prices fluctuations do happen so check the current price). The ACOG is a well-made optic that is perfect for close to moderate ranges. It’s also not the only scope on the market. The ACOG is always a great option, but remember there are other options that may suit your needs more efficiently, and for a much more affordable price. Good luck!